The general cargo ship Thuan Phat 8 sank in Gulf of Tonkin on 30 nautical miles off Quang Binh, Vietnam. The vessel started issued distress signal after getting water ingress in engine compartment in adverse weather. The shop lost propulsion power and started sinking, as the crew were unable to pump out the water from the aft part. The distress signal was received from Vietnam MRCC and at the scene was dispatched rescue boat, which evacuated all the crew from a life raft near the sinking ship. 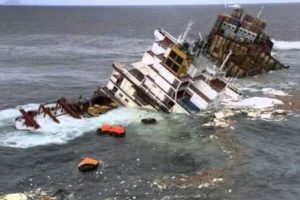 The rescuers estimated that vessel cannot be refloated and evacuated the crew, abandoning the vessel with increased list to port board and aft partially submerged. There were no injured people among the 11 crew, but small quantity of luboil spilled in the water. The local authorities are monitoring the site of sinking of oil leaks and more serious water pollution. The investigation for the root cause of the accident is under way, but according to preliminary information, vessel suffered cargo shift and mechanical failure of the main engine. The general cargo ship Thuan Phat 8 was en route from Hai Phong with 3,100 tons of rice on board. The ship has overall length of 79.00 m, moulded beam of 13.00 m and maximum draft of 5.30 m.